I love sage. Fresh or dried, it’s one of my favorite herbs and I love using it in nearly all of my recipes for Thanksgiving. I tend to go really heavy on the sage in recipes because I think it adds such a great flavor. Fortunately, my family doesn’t seem to mind. Not just because it’s cranberry week, but because I hoard cranberries, I’ve been on a kick using them in as many recipes as I possibly can. Sweet or savory, it doesn’t matter to me, I just love using them at this time of the year. Also, there may or not be five bags of them in my freezer. You never know when you’re going to need cranberries right? 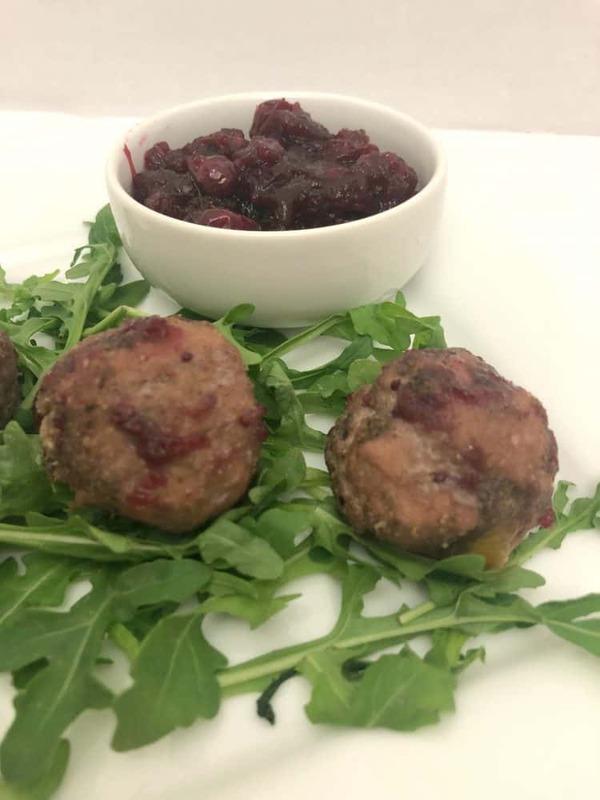 I try to change up what I have for lunch each week and I haven’t had turkey or meatballs in some time, so it was only fitting to make some Thanksgiving-flavored meatballs and serve them with some of the cranberry sauce I’ve been making. 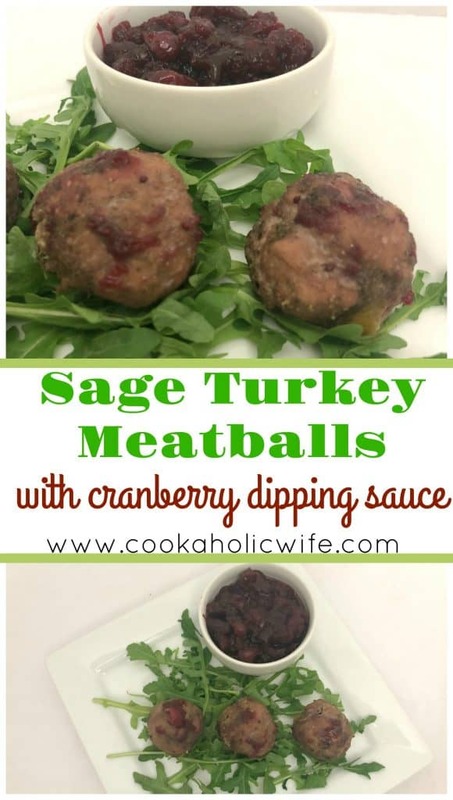 The flavors of Thanksgiving come together in these baked turkey meatballs complete with a cranberry dipping sauce. Preheat the oven to 350 degrees. Line a baking sheet with foil and place a wire rack on top. Put the ground turkey in a large bowl. Sprinkle the herbs, salt and pepper and bread crumbs on top. Gently mix together. Form into 15 2-inch meatballs and place on the prepared wire rack. 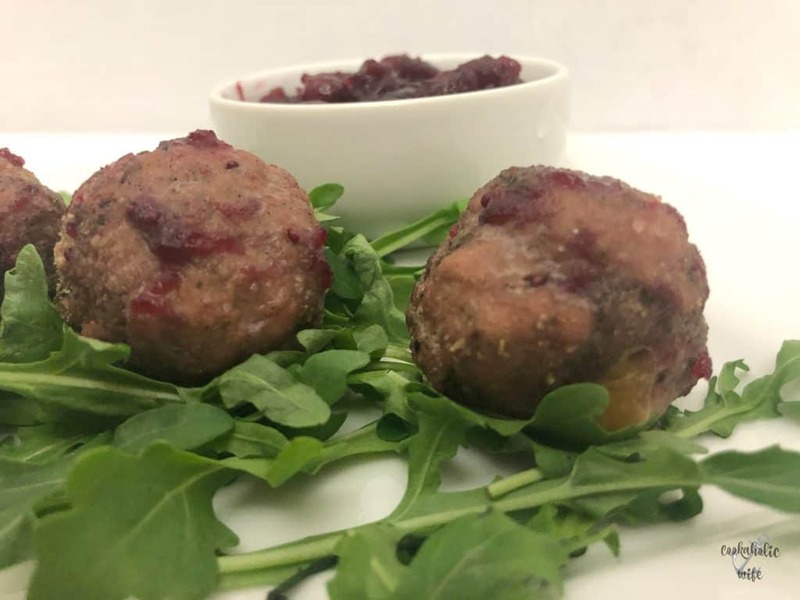 Serve meatballs with warmed cranberry sauce. If you’re not a fan of sage, you can reduce the amount to one teaspoon and add in some other herbs like rosemary and thyme to still get that Thanksgiving flavor. I enjoyed these meatballs alongside a simple arugula salad.